Only 4 left! 4 items in stock. Sale items are not eligible for quantity discounts. The SparkFun Inventor's Kit for Photon is a great way to get started in the fresh IoT world and WiFi development. The SparkFun Inventor’s Kit for Photon provides you not only with the Photon RedBoard but everything you need to hook up and experiment with multiple electronic circuits! With the Photon SIK you will be able to complete circuits that will teach you how to read sensors, drive motors, and more. This product blows me away! It took a little bit to get it sorted out (Particle's issue, not SparkFun's.) Once you get it up and running you will be amazed at what you can do with this little device. Welcome to the connected world! Also, great support from SparkFun helping me sort through the issues. I'm asking here because I can't comment your Electron review: can you share what humidity/temp sensor you connected to the Electron (I imagine same story for the Photon), and what tweaks if any were required for software support? My go-to would be a dual I2C sensor, but I don't want to discover a rabbit hole of I2C library troubleshooting to successfully port the code... Thanks! Which kit is better for beginners? This redboard with photon or just the redboard? Depends on what you want to do. 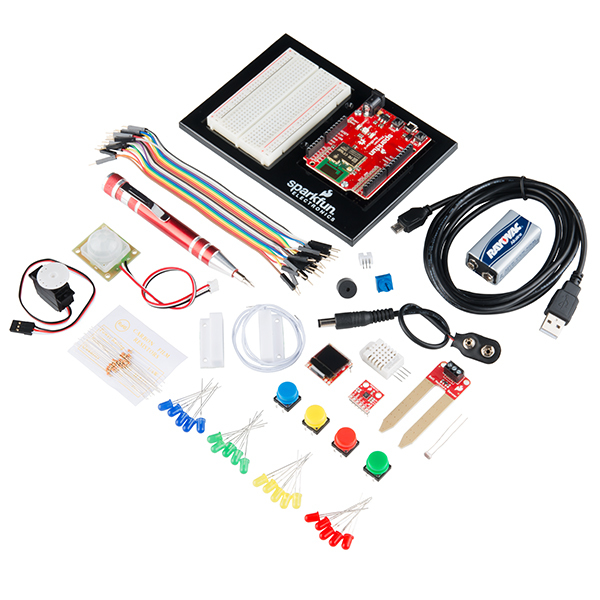 If you are looking specifically to get into Wireless and IoT then probably the Photon Redboard kit. The Photon Redboard is a Wifi based board programmed over the cloud, so it works well for IoT stuff. If you are just looking to get into microcontrollers the SparkFun Redboard is probably a better option as it is basically an Arduino clone. If you want to do IoT stuff but the Photon seems like a big jump you can get the Photon kit as well as a SparkFun Redboard. The manual for the SIK (based on the SparkFun Redboard) is available on the product page and the Photon SIK has parts for a lot of the experiments. Somewhere I saw that you will be selling this soil moisture sensor by itself. Any idea when we can expect that product? I don't know if you have seen it already, but if not, the soil moisture sensor can be found here. I've been playing with this for a couple weeks now, and I'm having a blast! The Experiment Guide is what really makes it work for me. I keep mixing and matching the experiments in the guide to create fun, new things on the Internet. I'm having a lot of fun inventing, programming and learning about the Photon API. Everything in this little package is full of fun - what a great way of getting familiarized with the IoT. I can highly recommend it. This product is currently used for a physics laboratory prototype, which uses servos, and the accelerometer sensor to demonstrate some laws of Newton. The kit engages a mechanical system developed Actobotis parts. The kit has everything that you need to explore a number of different projects. I love the integration with the Particle Build IDE. Nice work, SparkFun! I have really enjoyed this kit so far as an excellent introduction to IoT and services like IFTTT. The experiments and tutorials are great. Particle Photon's cloud environment works surprising well and to me, it's much smoother than the Arduino programming environment. Good companion items include the Make: Getting Started with the Photon book, DLI's IoT relay, and the Blynk app. Its totally easy to start! I am really beginner for this things. But really impress about how easy to start the project with this kit. Looking forward to do more complicated project in the future. It was simple to use and the projects were great for learning how to use the Photon. I thought the Sparkfun kits would be fun for my kids. I purchased the Photon kit for my home. The instructions for adding the Photon board to my home's wifi network was easy using the photon app on my iphone. My 9 year old and 12 old sons were better at plugging the resistors, led lights, wires, etc into the bread board than me. I have had the kit for a couple of weeks, and we were able to do most of the exercises. This is a fun kit to see the lights change based on the simple c code changes in the IDE. I like educating my kids about electronics and some simple programming. This is a good collection of starter pieces for someone who has no idea where to start. But I think the best part are all the online resources that sparkfun provides -- the tutorials are awesome, and their tech support shines too. Very fun! If I could change a few things, it would be: 1. Include the URL to the list of experiments on the web page 2. If items are going to be changed/or substituted, it should be noted. A little research, and I was back on track. A great way to get your foot in the door for microprocessors! Thanks so much! This is the second SIK that I have purchased (the other one was for the arduino). So far, have made it to Lesson 5 in the tutorial. It has been a great and enlightening journey so far! The tutorial has been well written, the experiments have gone well, and the explanations have been good. Looking forward to getting back and doing the remaining experiments. I do miss the nice case that the other SIK, but the screwdriver was a really nice touch. Notes for the product development team: - You need to have "SparkFun" engraved on the screwdriver! - Maybe (at some point) have supplemental (add-on) kits with new (advanced) tutorials/experiments to guide one even further.